Royal Couscous is a hearty dish that will feed a crowd, and can be varied according to the number of people at your table. What makes it ‘royal’ is that there are three kinds of meat: lamb, chicken and spicy merguez sausages. The lamb is cooked in a rich broth with vegetables and chick peas, and the chicken and sausages are grilled. When everything’s ready, the meat, broth and veggies are served on a bed of fluffy couscous grain. Couscous, which hails from North Africa, has become one of the most popular dishes in France. There are thousands of recipes for it. This one is closest to the Moroccan version, with cinnamon and saffron among the spices. The veggies I chose are carrots, zucchini, turnips and celery. You could also add pumpkin, which is often included in Morocco. The broth is flavored with spices including ras el hanout, a mixture that is available in supermarkets in France but that may be difficult to find elsewhere. You can make it yourself by grinding the spices in a coffee grinder. Grind 1/2 tsp. each of coriander seeds, fennel seeds, cumin seeds and cardamom seeds, and add 1/2 tsp. each of ground turmeric, ginger, cayenne pepper and cinnamon. A word about the merguez, which may also be difficult to find outside the French-speaking world. They are made of a combination of beef and lamb, and vary from mild to fiery. If they are not available where you live, you can simply make the dish without them — or be unorthodox and use pork chipolatas instead (I wouldn’t recommend it). The word ‘couscous’ is used to refer both to the hard-wheat semolina grain and the dish built around it. The traditional method of cooking the semolina involves a couscoussier: a two-tier pot in which the grain is placed in a steamer above the broth. In the old days, the couscous was removed from the steamer, rolled between the hands to separate the grains and returned to the steamer — four or five times! Happily the pre-steamed couscous sold today can be cooked in just a couple of minutes and fluffed with a fork. Making couscous (the dish) is a bit of a production. Preparation time is about two hours not counting the chick peas, which should be cooked ahead of time: boil in plenty of water until tender, about 90 minutes, add salt to taste at the end. The dish is generally brought to the table as follows: a platter of couscous (the grain), a large bowl of the broth with its veggies, a plate of the grilled and stewed meat and a small dish of harissa (North African hot pepper sauce). Each diner fills a shallow bowl with the grain, ladles on the broth and veggies, and tops it with meat. The harissa may be mixed with a little broth and poured over everything, or placed in a dab on the side of your bowl. This dish can be preceded by one or more starters, for example caviar d’aubergine, spicy carrot salad or tomato salad, and could be followed by fruit, a fruit salad or a light dessert. The quantities below will serve 4-6 people (depending on their appetites!). Cut the lamb into large cubes. Remove any fat. Peel and mince the onion. Heat the olive oil to sizzling in a large sturdy pot. Add the lamb and brown lightly on all sides, about 5 minutes. Add the onion and sauté, stirring, until tender, about 5 minutes more. Add the puréed tomatoes. Now add enough water to cover the meat. Add one more quart (liter) of water. Put the tomato paste in a small bowl and thin it out by adding 1 tsp. of water at a time, stirring. Add to the pot. Add the spices, saffron, crushed cayenne pepper, salt and black pepper. Bring to a boil, then turn down the heat and simmer for 30 minutes. While the broth is simmering, marinate the chicken. Combine the olive oil, harissa, cumin and salt in the bottom of a large bowl. Add the chicken legs and stir to coat well. Set aside. Preheat the oven to gas mark 7 (400 F, 210 C). Now prepare the veggies. Peel the carrots and chop into 2-inch (5-cm) logs. Peel and quarter the turnips. Use a vegetable peeler to remove strips of peel from the zucchini to create a striped effect (I don’t know why this is done, but it is traditional — see photo). Trim away the celery leaves and cut the branches into pieces. When the broth has simmered for 30 minutes, add the carrots and turnips. Add the cooked chick peas. Taste and add more salt if necessary. Keep the pot simmering for another 20 minutes. At the same time, place the chicken legs in an oil baking pan and put in the oven to roast for 40 minutes. Baste from time to time. When the broth has been simmering for 20 more minutes, add the zucchini and celery. Simmer for 20 minutes more. During this last simmering stage, fry the merguez in a skillet until the sausages are evenly browned on all sides. When they’re ready, drain them on a paper towel and return to the pan to keep them warm. Now make the couscous. Bring 2 cups of salted water to boiling. When it boils, add the couscous, immediately turn off the heat and cover the pot. Wait two minutes, then open the pot, add the butter and fluff with a fork to break up the lumps. Cover the pot again and place it over very low heat to steam for one more minute. Fluff again. Everything should now be ready. Serve as described above. Serves 4-6. To simplify, you can make the broth and veggies ahead of time. 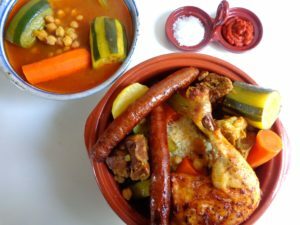 Then finish the dish about an hour before serving: marinate and roast the chicken, reheat the broth, prepare the merguez and steam the couscous.